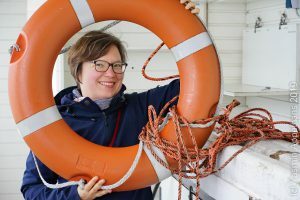 Now that I have introduced the new tag “kitchen oceanography: food related” to my blog, it’s time to add a couple new posts to that category. And today I have a fun post for you! But first, what does “kitchen oceanography” even mean? It’s pretty apparent why “kitchen oceanography” is a great alternative to regular tank experiments: because you can do it with stuff you have at home rather than needing access to a lab with a tank, and then a lot of water, salt, dye, other resources to conduct the experiments. Doing kitchen oceanography, we use a minimal amount of resources. But the second, even larger benefit to me is that you can do these kinds of experiments and observations basically everywhere and at any time. So you can fit in a quick session of kitchen oceanography while sitting in front of the fire place on a skiing trip with friends, or while doing the dishes with your godchild. And you can inspire others who might not have access to labs to still do cool oceanography experiments, at home or wherever they like! Apparently, the biggest predictor of future interest in STEM topics is whether people as kids often cooked with their parents! No literature source for this, but that’s what my educational research colleagues next door told me… So playing in the kitchen, whether on kitchen oceanography or with food, is a good thing! Observing boiling eggs might not sound like a super exciting activity to engage in, but sometimes it is. 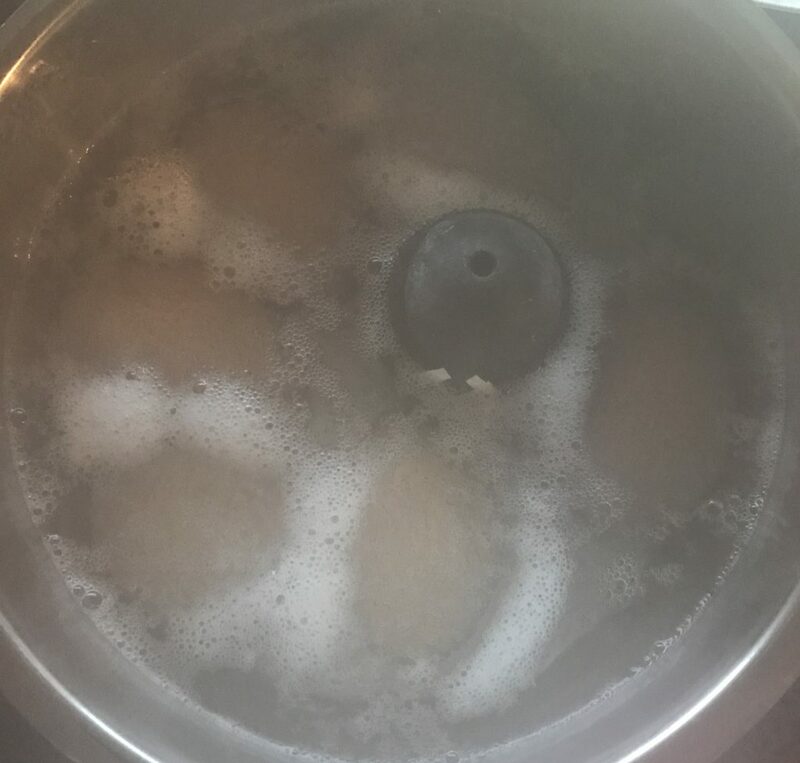 Last year we did observe interesting foam pattern when boiling eggs (I still can’t explain where the foam is coming from! Can you?). The pattern in the foam show the convection pattern of the boiling water around the eggs which act as obstacles. 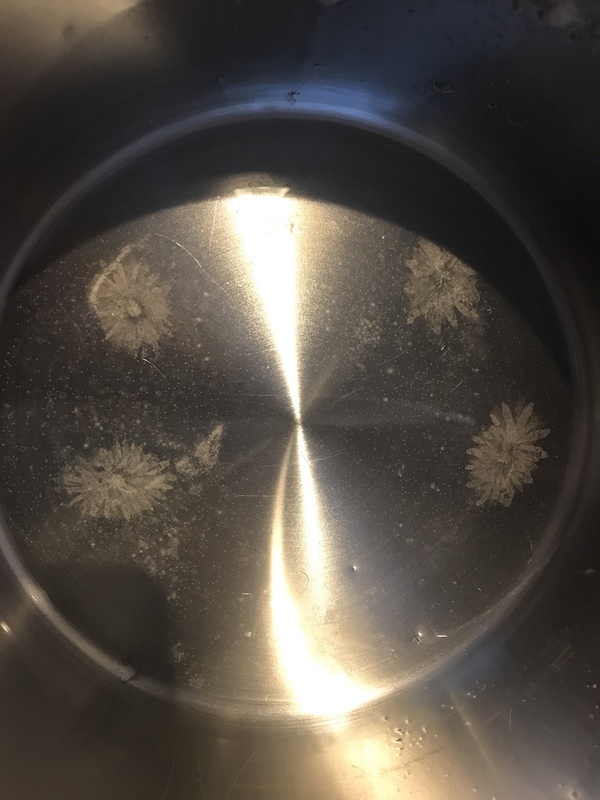 Water is raising from the bottom of the pot to its surface, bringing up foam. But the eggs are located so close below the water’s surface that the circulation above them (if there is one) is pretty much disconnected from the convection happening all around the eggs. Even the empty pot still shows you what the circulation pattern must have been like! 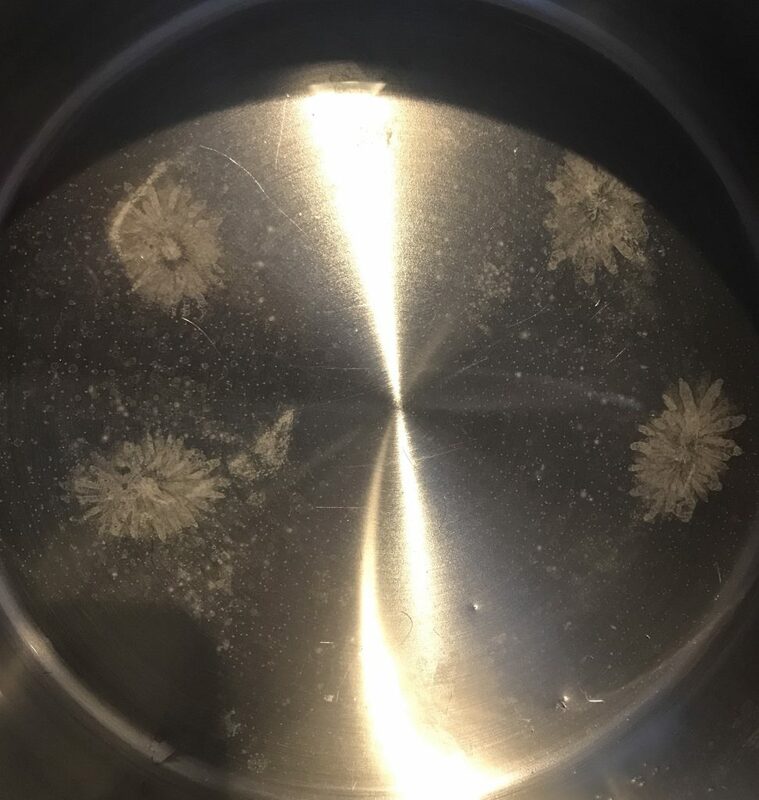 But then the next cool thing happens when you throw out the water: There are limescale crystals on the bottom of the pot! And, interestingly enough, they show the former locations of the eggs. And I think they are forming in exactly those spots because just as there is (hardly any) circulation above the eggs, the circulation below is also inhibited, water has longer residence time (because it isn’t whipped away by convection) and those crystals can form. An alternative explanation might be that there is more limescale below the eggs because calcium carbonate gets dissolved from the egg shells and gets deposited as limescale right below the eggs because the concentration is highest closes to the eggs. Which explanation do you think is more likely? Or do you have another one entirely? 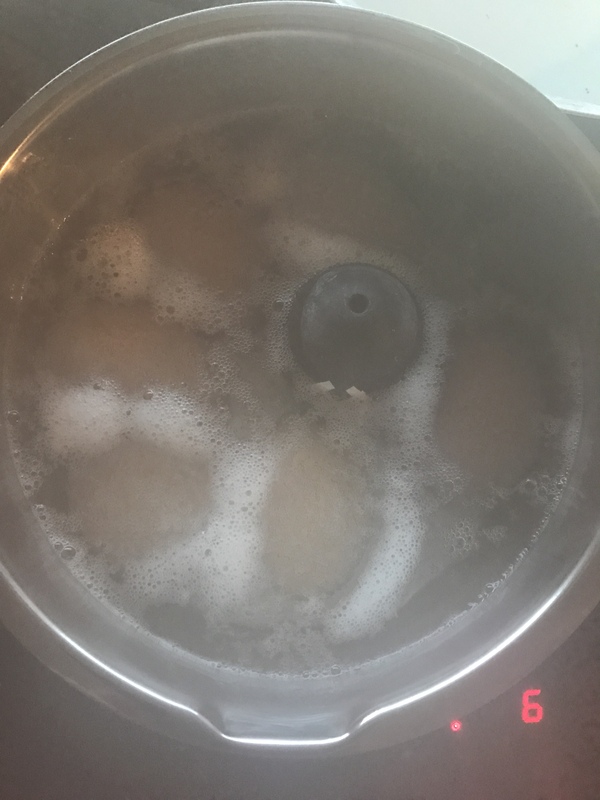 This entry was posted in kitchen oceanography and tagged convection, eggs, kitchen oceanography, kitchen oceanography: food related, ocean circulation on August 31, 2018 by mglessmer.